Modeling antique fonts after historical materials gives you intimate familiary with those old letters and journals and maps. The maps that inspired our Geographica serif family proved more fruitful than I first expected: they begat a pair of spinoffs of sorts, each replicating a particular 18th-century handwritten style. This is one of these. (Geographica Script is the other.) 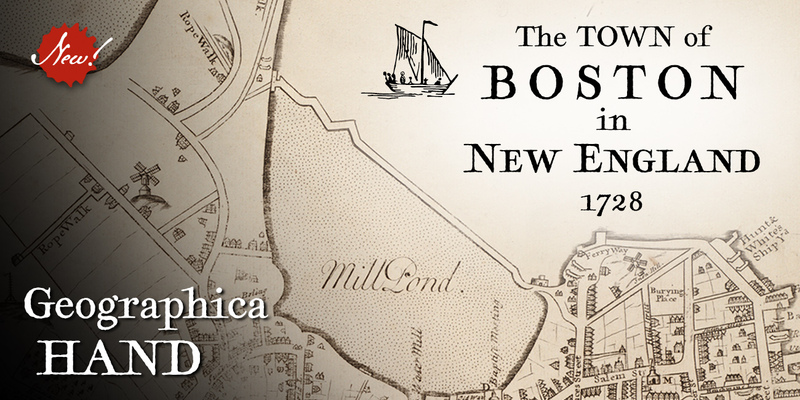 Geographica Hand mimics the careful hand-lettered serif text on a series of British maps printed in the 1700s by Emanuel Bowen, Thomas Jefferys, and othersseveral of them representing Colonial America and Canada. The letterforms have long serifs, irregular lines, and an agreeably organic feel. Geographica Hand comes with a series of sketchy map ornamentschurches, windmills, boats, trees, and such. Best perhaps for display situations, but plenty legible in text blocks, as well. OpenType features include true small caps, contextual and discretionary ligatures, lining and old-style figures, cartographic ornaments, and full Latin support900 glyphs in all. US$39.